Coming Back From a 28-10 Halftime Deficit. 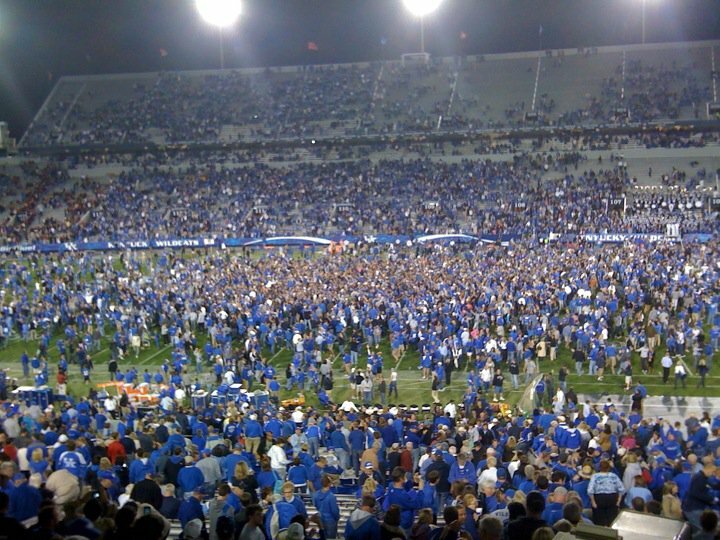 Why Doesn't UK Football Get Any Respect? The main man: Mike Hartline emerged from a near seven-month battle to win the quarterback job going into his senior season. Hartline doesn't overwhelm with his physical skills, but he has a good command of the offense and seems to have gained the respect of his teammates. The supporting cast: Sophomore Morgan Newton led the team to a 5-3 record after Hartline was injured at South Carolina last year. Newton has the strongest arm of the three quarterbacks and is also the biggest running threat, but he's still trying to find his way as a pocket passer. Newcomer to watch: Ryan Mossakowski is slowly shaking off the rust after redshirting last year while recovering from shoulder surgery. Mossakowski is a pure pocket passer who also has good field presence. He's currently pushing Newton for the backup job. Outlook: Hartline is the unquestioned starter for the moment, but nothing is etched in stone. Even if Hartline plays well and holds on to the job, the Wildcats must start looking to the future, so expect Newton and Mossakowski to play at various points during the season. 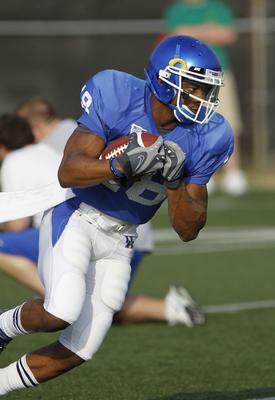 The main man: Randall Cobb has been UK's "Mr. Do Everything" the past two seasons. 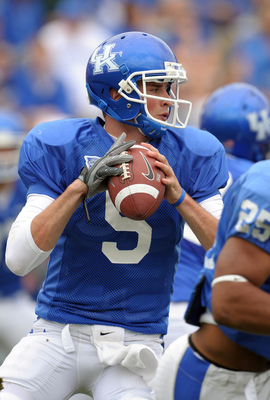 Though he'll still run back kicks and play some quarterback in the Wildcat, he should be a much more polished receiver in 2010. Assuming there's more consistent quarterback play, Cobb should greatly improve on last year's numbers (39 catches, 447 yards, five touchdowns). The supporting cast: Chris Matthews had some ups and downs in his first year out of junior college, but the 6-foot-5, 220-pounder has been impressive in fall camp and will be a solid No. 2 to Cobb. Sophomore La'Rod King has missed several practices with a neck injury but showed promise as a freshman and will be the No. 3 receiver assuming he's healthy. The coaches are still waiting on junior Matt Roark and sophomores E.J. Fields and Aaron Boyd to make a push. Newcomer to watch: Redshirt freshman Brian Adams has it all physically: size (6-4, 232), speed (sub-4.4 40-yard dash) and athletic ability (outfielder for the UK baseball team). Adams is still trying to pick up the system, but if the light goes on this fall, the Cats could have a keeper. 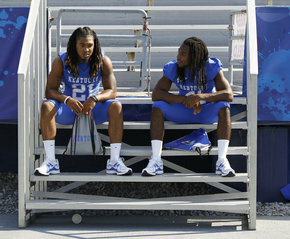 Outlook: The Wildcats are set with the starting duo of Cobb and Matthews, but there are major question marks after that. Coach Joker Phillips likes to run three, four, and five-receiver sets, but he'll need King to remain healthy and Adams to speed up his development in order to have a reliable rotation. The main man: While slightly overlooked on the national scene, senior Derrick Locke established himself last season as one of the best backs in the Southeastern Conference and one of the most versatile backs in the country. Locke is highly motivated to eclipse 1,000 yards rushing this season. Provided he stays healthy, that shouldn't be a problem. The supporting cast: Sophomore Donald Russell had some nice runs in mop-up duty as a true freshman and cemented his status as the No. 2 back behind Locke in the spring. 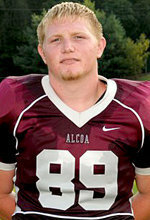 Redshirt freshman Jonathan George probably would have played last fall had he not suffered an ankle injury in fall camp. Sophomore CoShik Williams had 14 carries as a freshman walk-on and is trusted by the staff. 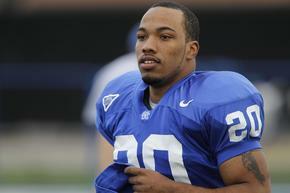 Senior Moncell Allen, who's played mostly tailback, will line up at fullback when the Wildcats go with two-back sets. Newcomer to watch: Freshman Raymond Sanders has impressed everyone with his ability to come in and pick up the system. A 5-foot-8, 185-pound waterbug with some wiggle in his hips, Sanders has a bright future as a Wildcat. Outlook: This is the deepest position on the team. Locke is the clear headliner and appears headed for a monster season, but the coaching staff won't be afraid to use Russell, George, Williams or the two freshmen. The main man: Junior Stuart Hines was voted the most improved offensive player last year by the UK coaches, and this could be the year he gets recognized among the best in the league. Hines has the three things all coaches look for in a lineman: He's smart, tough, and physical. The supporting cast: Chandler Burden is still learning the left tackle position but has the strength and footwork to be a standout once he gets fully acclimated. Sophomore right guard Larry Warford could also make a name for himself if and when the light comes on. 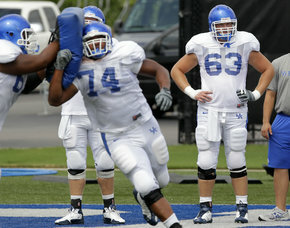 UK is in good hands at right tackle with steady veteran Brad Durham. The loser of the battle between Matt Smith and Jake Lanefski at center will be a top reserve. 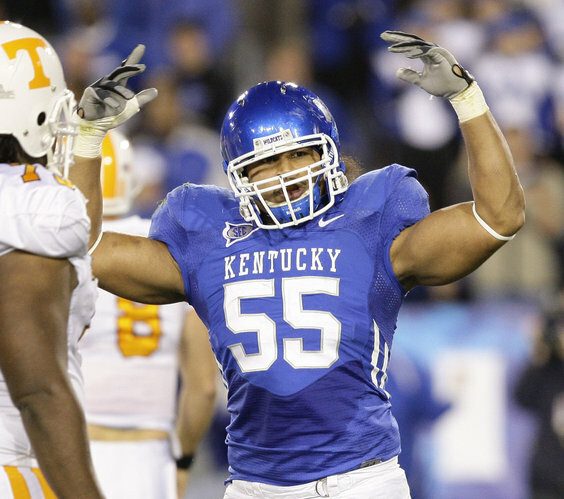 Newcomer to watch: Sophomore Trevino Woods has bulked up considerably since arriving at UK in 2008 and has put himself in the mix for backup duty at tackle. Outlook: Replacing four starters naturally raises eyebrows, but things were never quite as bad as they seemed. Hines is as steady of an anchor as you can ask for. Durham, Murphy, and Lanefski all have started SEC games, and Warford played a lot of snaps as a true freshmen. Coach Joker Phillips believes that Mike Summers has molded this into a reliable unit during fall camp. The main man: Junior Nick Melillo is the only tight end that has seen game action, catching five passes in a limited role last year. Melillo isn't very big (6-2, 242) but showed in the spring that he can be an option in the passing game. The supporting cast: Redshirt Jordan Aumiller's size, hands and instincts convinced the staff to move him over from linebacker. He should get some early looks. Another redshirt freshman, Anthony Kendrick, passes the look test but is still learning the ropes as a blocker. Newcomer to watch: Alcoa, Tenn., native Tyler Robinson came in with much less fanfare than classmate Alex Smith, but Robinson has been the most impressive rookie tight end thus far. Robinson has shown both the ability to take care of business as a run-blocker and make plays as a receiver. Outlook: Joker Phillips' offense works best when he has a reliable tight end, but it's unlikely that any of the young tight ends will be able to set the world on fire right off the bat. 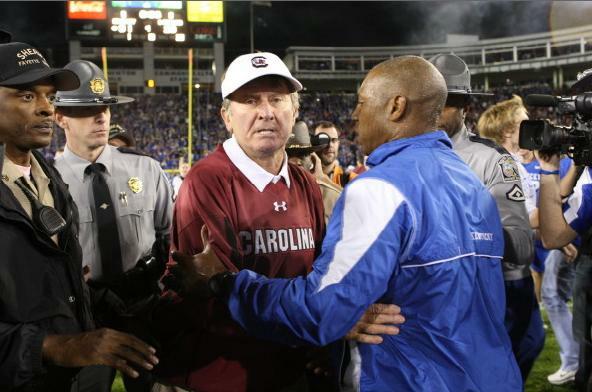 Several players should get opportunities to play, and the staff hopes that a legitimate No. 1 guy emerges at some point. The main man: Junior Ryan Tydlacka fared well in his first year as a full-time punter, averaging 40 yards per kick. He was particularly good with regards to hang time — only 11 of his 64 punts were returned. Tydlacka could also win the placekicking job. The supporting cast: The return game is in fine hands with Randall Cobb and Derrick Locke, who have combined for three return touchdowns in their careers. 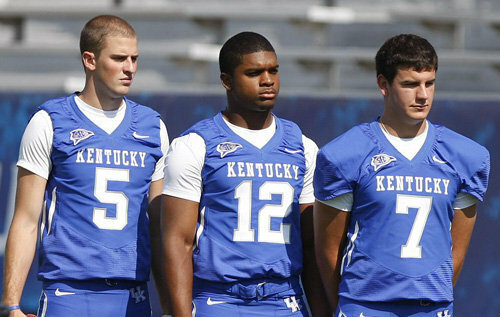 The Cats also have a lot of speedy young players who could give Cobb and Locke a break if need be. Newcomer to watch: Freshman Joe Mansour could end up being the placekicker if he can show consistency. He was named the first-team kicker on Georgia's "All-Decade" team and kicked a 59-yard field goal in high school, the third-longest in state history. Outlook: The Wildcats have the makings of a good special teams unit. They have two dangerous returners (Cobb and Locke) and a seasoned punter (Tydlacka). 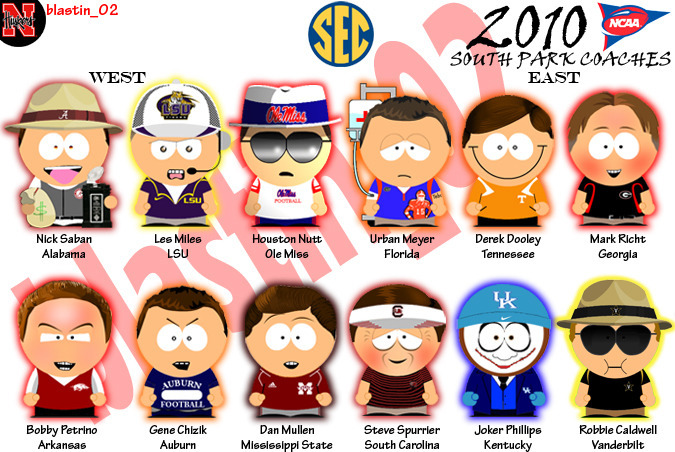 If Mansour can solidify the placekicking, this could be UK's best overall unit in years. The main man: The UK coaching staff has been talking about the potential of Winston Guy for two years; now it's time for the Lexington Catholic product to live up to it. Blessed with size and speed, if Guy can become a more consistent tackler and stay focused on his assignments, he could be headed for stardom. The supporting cast: Junior Randall Burden has slowly developed into a solid corner, and sophomores Martavius Neloms and Cartier Rice are game-tested as well. Junior Taiedo Smith and junior-college transfer Josh Gibbs provide depth at safety and in the nickel packages. Newcomers to watch: Two fresh faces are making a big-time push for starting jobs: Junior-college transfer Mychal Bailey has become a front-runner to start at safety, and freshman Jerrell Priester has been running with the first unit at corner. Both players are fast and physical. Outlook: The secondary has some lofty standards to live up to. Even with starters Trevard Lindley and Paul Warford injured for much of the year, the Wildcats were one of six FBS teams to hold opponents to less than 50 percent passing. The others on the list? Nebraska, Iowa, Alabama, Texas Christian and Virginia Tech. Burden is reliable at corner, and Guy has All-SEC potential. The additions of Priester and Bailey have raised the talent level, but also make the secondary short on experience. There might be a few more big plays, but it will be interesting to see whether consistency is a problem. 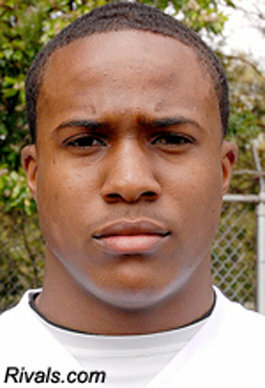 The main man: After being a sidekick to All-SEC linebackers Micah Johnson and Sam Maxwell, junior Danny Trevathan steps to the forefront in 2010. Trevathan can run and hit and should flourish in more of a lead role. The supporting cast: Four players are battling for the other two spots on the depth chart. Junior Jacob Dufrene and sophomore Ridge Wilson continue their competition on the strong side, while junior Ronnie Sneed and redshirt freshman Qua Huzzie are doing the same in the middle. Huzzie came on strong in the spring but has been slowed recently by a foot blister. There's very little experienced depth at any of the three positions. Newcomer to watch: Freshman Avery Williamson has taken advantage of some missed time by Huzzie to throw himself into the fray at middle linebacker. Williamson is physical and should see snaps as a backup and on special teams. Outlook: It's fuzzy right now. Trevathan should be solid, but the coaches still aren't sure who will start at the other two positions. 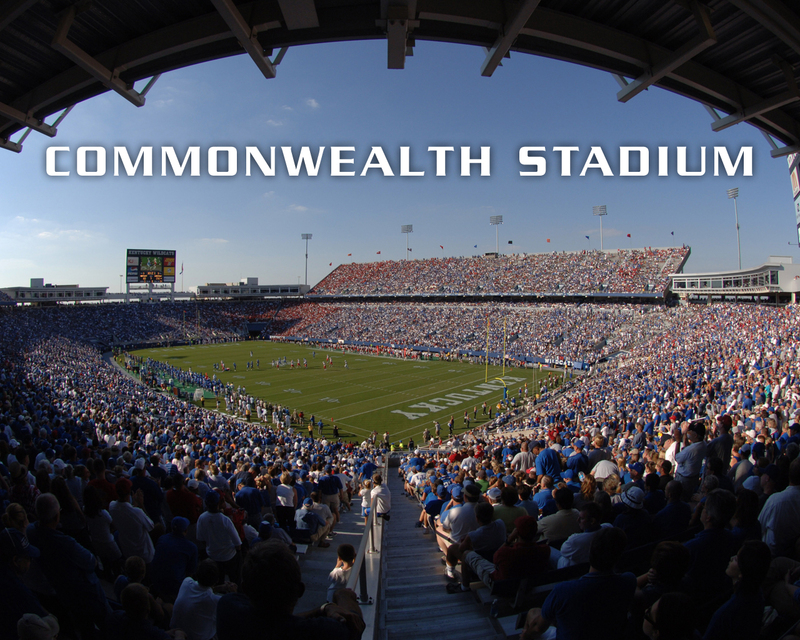 The strong-side position could be de-emphasized when the Cats are in the nickel package. T he main man: DeQuin Evans is the heart and soul of the defensive line and is the only proven pass-rushing threat up front. A relentless worker and potential All-SEC candidate who has the respect of his teammates, Evans will likely see his share of double-teams until the rest of the line proves themselves. The supporting cast: Senior tackle Ricky Lumpkin has shown flashes when healthy, but now the Wildcats need him to step up and have a career year inside. Junior Mark Crawford is stout enough (6-1, 293) to be a space-eater in the middle and should get more reps after spot duty last fall. Sophomore Taylor Wyndham had seven starts and two sacks last season and became a national name for his hit on Florida's Tim Tebow. Newcomers to watch: Freshman Nermin Delic's strength and non-stop motor have pushed him into the mix, and if he doesn't start the opener at Louisville, he could be in the lineup before too long. The same can be said for freshman tackle Donte Rumph, who's comparable in size and athleticism to Myron Pryor, now with the New England Patriots. Outlook: UK has had some standouts on the defensive line the past few seasons — Pryor, Corey Peters and Jeremy Jarmon are all in the NFL. This year's line doesn't have much experience or production returning, so several things need to happen for the line to exceed expectations. First, Evans must stay healthy. Second, Lumpkin must put it all together in his senior year. Lastly, the freshmen need to be as good as advertised. 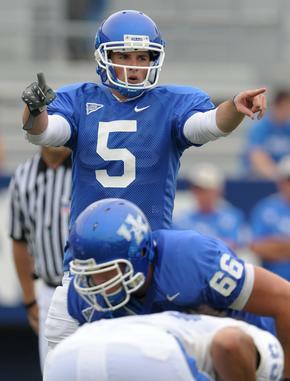 Kentucky Coach Joker Phillips ended weeks of suspense and speculation on Monday when he named Mike Hartline his starting quarterback for the Wildcats' opener at Louisville on Sept. 4. Hartline, a fifth-year senior, beat out sophomore Morgan Newton and redshirt freshman Ryan Mossakowski. Phillips said Hartline made the fewest mistakes among the three quarterbacks, and he said there was always some separation between Hartline and the other two. "He was slightly ahead at all times, there was no question about that," Phillips said. "But it wasn't far enough ahead to where we felt we had to make a decision. If we had made the decision in the spring or at the beginning of fall camp, I don't think it would have been fair to the other guys who are a little bit younger. We had to give those guys a chance to compete. But at this point in time, Mike gives us the best chance to win." The Question of Who Should Be the QB has been a Major Source of Fan Dissention over the last 2 seasons, and 2010 has been more of the same.